The Hague has been my home for the past four years. Prior to that I lived in Amsterdam for three, and while the transition wasn’t without difficulties the city eventually grew on me. While I’m still very much fond of the capital, I find The Hague much more of a livable, laid back, and no-nonsense city. Although I have been living here a while I still enjoy exploring the city, discovering new cafes, bars, restaurants, finding small galleries, shops, and concert venues that I have previously missed during my daily commute. I also consider myself a foodie and The Hague is, without a doubt, a food heaven for people like me. Therefore it’s no surprise that I took part in a food tour organized by two local girls, Marthe and Kerensa from Bites and Stories. We started our tour at the oldest bakery in town, in one of the small streets in the center. 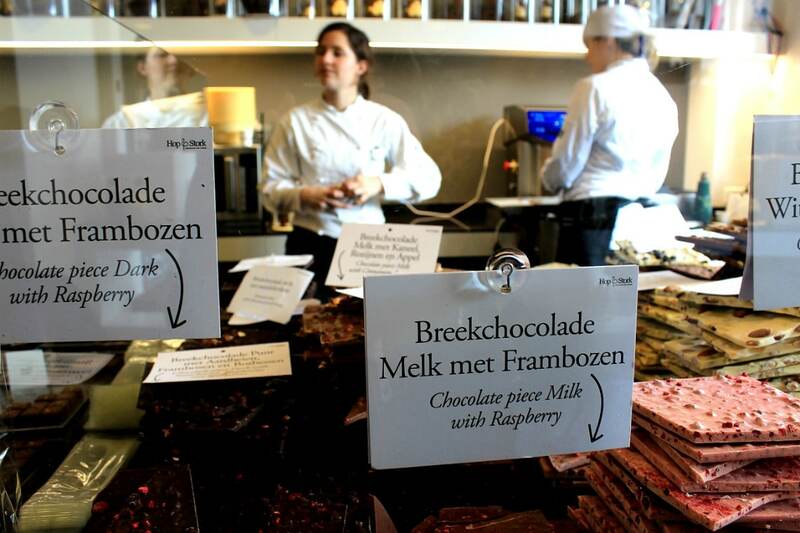 Besides the usual bakery selections the ‘t Bakkertje also offers local delicacies such as the Haagse Poffer, a sweet spongy cake with a spicy (not hot!) filling. The shop also sells the liquor version of this cake and both helped us start our walk on a high note. Just around the corner we visited Dungelmann, a famous butcher on the Noordeinde who even supply the royal family with their products. We tried their deep fried ‘ragout’- filled krokets and juicy meatballs. Both are beautifully flavoured, no wonder the royals love ’em too. According to the girls, the place is always packed, especially during lunch hours when the queue stretches out onto the street. The Dutch absolutely love their coffee therefore it wouldn’t be a proper food tour if we didn’t stop for coffee (and chocolate). Hop & Stork is a cute chocolate and coffee place conveniently located in the beautiful Passage. This place was opened by two former bankers who got bored with their corporate life – now they own a café where their produce was awarded third place in the national coffee competition in 2015. Our next stop was a fish snack vendor just next to the Binnenhof for a Dutch delicacy: ‘haring’ (aka herring in English). I consider myself a relatively open-minded foodie but as I tried this before and I’m definitely not a fan, I passed. The girls tried to convince me that this fish stall sells amazingly fresh and tasty smoked herring but I’m quite determined – sorry, not sorry! If you do decide to try the snacks be careful as the seagulls circle above the stall and are quite cheeky. It was then time for something healthy so we stopped at Fine Fresh Food an organic, raw, vegan, etc. lunchroom. We tried the beet-burger and the sushi-burger which divided the group, however, the super colorful ‘juice of the day’ packed with more vegetables and fruits than I have in a month was a hit. I had passed the Vegetarian Butcher many times before and, frankly, thought it was a bit tongue-in-cheek… a vegetarian butcher? Oh how wrong was I! We tried a number of their products: tuna on toast, sausages, sausage rolls, etc. all without any meat or fish ingredients, all soy-based. They were incredibly flavorful and honestly could have fooled me – apparently that’s one of the reasons some vegetarians are not fans. However, it did lead to the shop earning awards at national butcher competitions across the country alongside ‘proper’ butchers. We wandered around China Town which actually used to be the Jewish quarter of The Hague and passed the Rabbijn Maarsenplein, which besides a playground has a monument dedicated to the Jewish children of the city. While Marthe and Kerensa talked about the history of the area they gave a spekkoek to each of us in the group. It is from their favorite Indonesian takeaway, Toko Toet. It’s a bit out of the center so instead of us going to them, they decided to bring the flavor of the toko to us. The cake was wonderfully soft and spicy. Our last but one stop was the first (and apparently only) Lebanese bakery in the Netherlands, Baladi. 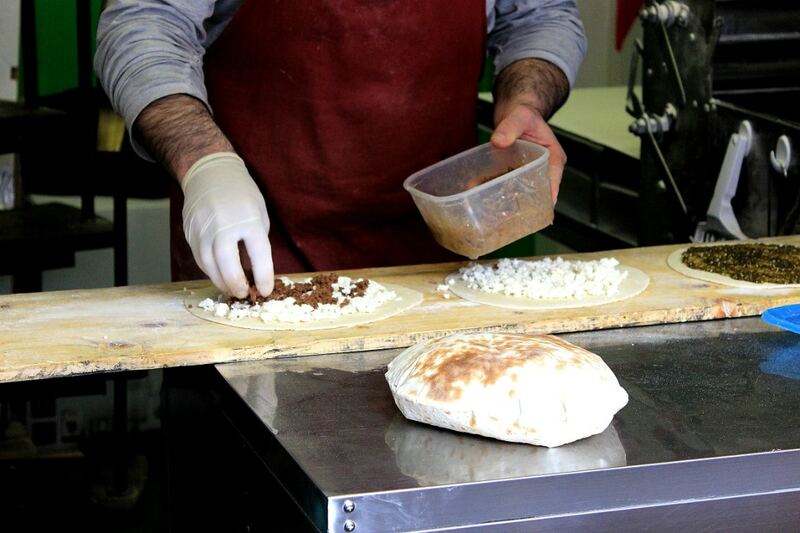 By this time everyone’s belly was full but the smell of the freshly baked man ouches was so enticing that we ended up finishing all the flatbreads, some filed with cheese others with minced meat – they are delicious. We finished the tour in one of the most famous pubs in The Hague, Huppel the Pub. We all tried one of the local beers, the Haagse Broeder, brewed by the monks at the monastery two doors down from the pub. I’m not crazy about beer but this one actually felt quite soothing after a full-day of snacking. The tour was a great successes: we tried some amazing snacks and drinks, made new discoveries in The Hague, and learned about the history of the city – all thanks to our very enthusiastic guides, Marthe and Keresena. 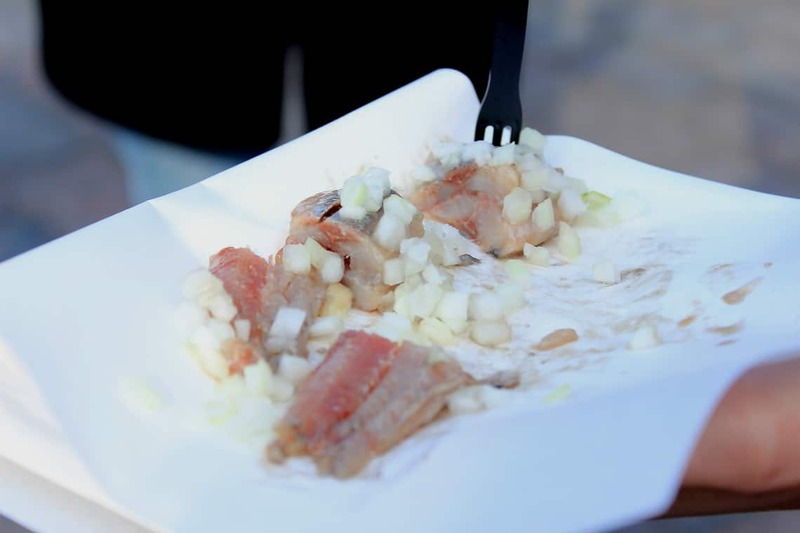 During her culinary discovery of The Hague, Noémi Nagy was a guest of Bites and Stories. 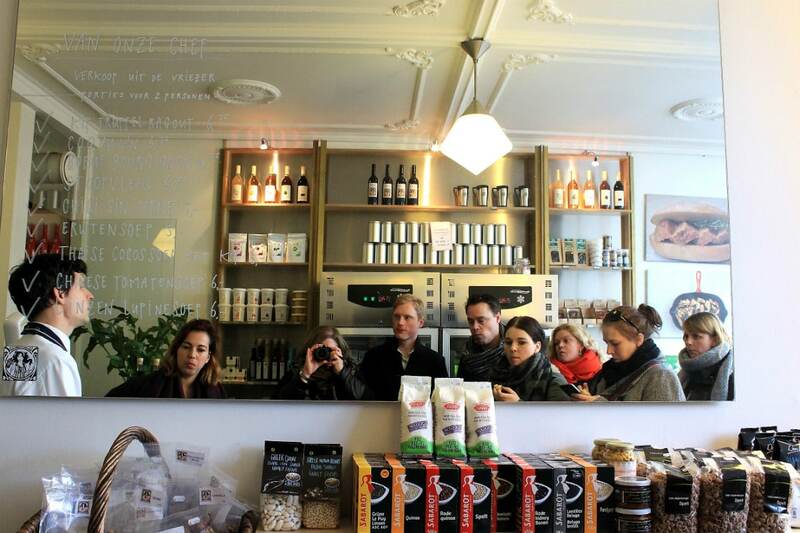 2 Responses to "Food Tour Around The Hague"
I always enjoy reading Noemi’s reviews. They are concise, informative and entertaining. I only wish she was here in the states as I would love to be her partner in an adventurous food tour.